A lot of people ask us, “What is the best investment for beginners?” or “Saang investment ba yung ok?” There are so many options these days that it’s hard to figure out the difference between them all. 1. How much money can you invest? As the saying goes, you need money to make money. Each peso you invest is like a seed—the more seeds you have, the more trees you can grow, and the more fruits you can harvest. The more money you have to invest, the more money you can aim to make. The amount of money you can invest will also determine which investment options are available to you. Investing is not only for the rich, but there are some investments that require a lot of capital. A good rule of thumb to find out how much you can invest is to subtract 6 months worth of expenses from your savings. The remaining amount is what you can invest. Every month, make sure you still have enough money to cover 6 months worth of living expenses before adding more money to your investment fund. It’s important to keep your investment fund separate from your living expenses because investing is not a get-rich-quick scheme. It takes time. If you need to pull out your investment too soon, then you’ll likely end up losing money—and nobody wants that. 2. How long can you keep your money invested? Aside from money, another very important resource when investing is time. The longer you’re willing to keep the money invested, the more investment options you’ll have and the more money you can potentially make. Because of compounding interest, your money will grow exponentially faster every year you keep it invested. As the interest from your investment is added to the next year’s principal amount, the impact of compounding interest becomes so big that the amount of time eventually outweighs the amount money you invest. Here’s an example showing two investors, Person A and Person B. 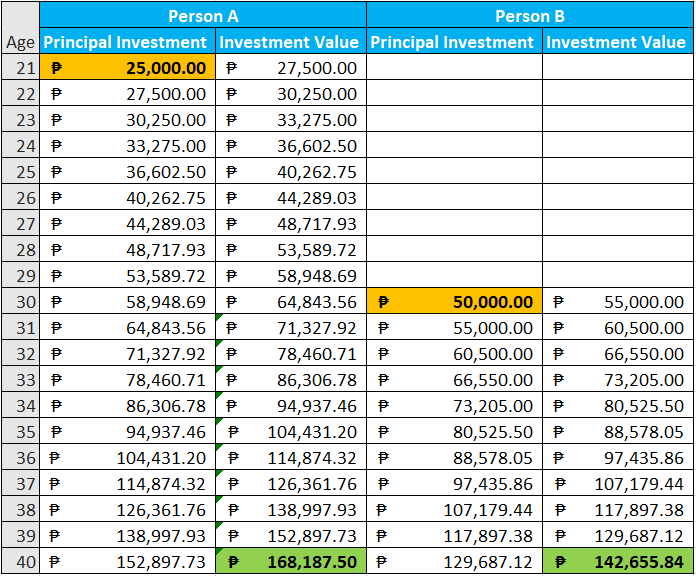 Person A invested P25,000 when he was 21 while Person B invested P50,000 when he was 30. Assuming the interest rate is always 10% for both cases, you’ll see that Person A’s investment will actually be worth more when they’re both 40 years old—even though Person B put in twice as much money. When investing, think long-term. You’ll get the best results if you can invest your money for 10 years or more. 3. How much effort can you put into managing your investment? If you have the time and dedication to educate yourself and manage your own investment, then you can save a lot on fees that would normally be paid to fund managers and financial advisers. It may even open up some investment opportunities that you couldn’t consider otherwise. While it’s true that businesses can be great investments, they will only succeed if you put in the time and effort to run it well. Otherwise, you’ll just be throwing your money down the drain. If you don’t have the time and energy to manage a high-maintenance investment, don’t worry. There are a lot of other investment options out there, which we’ll discuss later. 4. How much risk are you willing to take? By now you’re probably tired of hearing this over and over, but it’s true—if you want bigger rewards, you’ll need to take on bigger risks. It’s difficult is to figure out exactly how much risk is right for you, but one thing’s for sure: There is no risk-free investment. If you’re putting your money somewhere that’s risk-free, the interest rate will be so low that you end up losing money due to inflation. And if you’re losing money, then that’s not really an investment anymore. Take savings accounts for example: Banks guarantee to keep your money safe and you definitely won’t lose a single centavo. 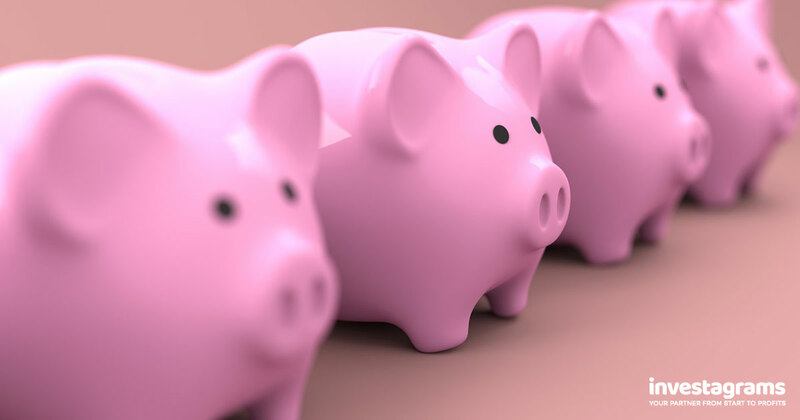 However, the interest rate for most savings accounts is only 0.25%. That’s around 2.75% less than the average inflation rate, meaning that the value of your money decreases by 2.75% every year! On the other hand, investing all your money in a new company that may or may not exist next year could lead you to lose all your money. But you might also have invested in the next Facebook and end up making a bigger profit than you ever dreamed of. It’s always a balancing act when we talk about risk and reward, and the perfect mix is different for everyone. You need to take some time and really think about what would be the right balance for you. Here’s a table summarizing the main investments available in the Philippines, and what their characteristics are in relation to the four questions above. If you find any of these interesting, then scroll down for more details. VUL insurance plans are one of the most popular investment options in the Philippines. It’s a flexible and low-maintenance investment that hits three birds with one stone—life insurance, health insurance, and mutual funds. If you don’t have insurance yet, you should seriously consider getting VUL insurance. Minimum Investment: VUL insurance plans are very flexible because they are personalized to your needs. You can have premiums that are as low as a couple thousand pesos per month. Just keep in mind that your benefits will be proportionate to the amount you invest. Investment Period: Though there is some flexibility with VUL insurance, it’s best to aim for an investment period of at least 10 years. Most plans will deduct the largest fees in the first few years and let you invest for free by the 5th year or so. Risk and Return: The risk profile and rate of return with VUL insurance is average overall, but can be adjusted based on your preference. Insurance companies usually have a few funds that cater to different risk profiles. Just make sure to get a good insurance agent so they can customize the best plan for you. Mutual funds are another low-maintenance investment that is popular among Filipinos and especially working professionals. It has a lot of the same benefits as VUL insurance, but with two key differences: you won’t get any insurance (obviously) and you can think relatively more short-term. Put simply, mutual funds operate by pooling together money from many different investors and investing those in various assets and securities. That way it’s easier to diversify and manage risk. Minimum Investment: Some mutual funds in the Philippines now have minimum investments as low as P5,000. The minimum investment will vary depending on which fund you’re looking at, but they’re all relatively low as far as investments go. Investment Period: There is usually a lock-in period for mutual funds, though they can be as short as 90 days. You could even take out your investment earlier if you need to, but there will be a penalty. And of course as with any investment, you should think long-term if you want to see the biggest returns. Risk and Return: Similar to VUL insurance, mutual funds have an average amount of risk and return. They can be higher or lower depending on the exact fund you choose, but professionally managed funds will be less risky than managing your own money. If you’re after bigger returns and don’t mind taking on a little more risk, then investing in stocks is a great way to go. It’s like the DIY counterpart to mutual funds. You’ll have to put more time and effort into managing your investment, but you’ll also have greater potential returns because you won’t have to pay any fund management fees. Minimum Investment: Nowadays, you can open a stock trading account for as little as P2,500. Some brokerss won’t even require a minimum investment if you already have a savings account with their bank. Just keep in mind that, if you can afford it, we would still recommend start with at least P8,000. More on that here. Investment Period: Stocks are very liquid investments, which means that it’s easy to sell, take your cash, and get out at any time. But keep in mind that even stocks require some time to earn substantial returns. There’s also a good chance that you will lose money if you need cash and have to sell your stocks at a loss. Always remember: Investments are not get-rich-quick schemes. Risk and Return: Directly investing in stocks as an individual does carry more risk than VUL and mutual funds. Unlike professional fund managers, you won’t have a big corporation and fellow professionals helping you out. You’ll also have a smaller fund, which means you won’t be able to diversify your stock picks and manage risk as easily. Of course, the upside to all of this is that if you succeed, you’ll get to keep all the profits for yourself. Minimum Investment: The initial investment for businesses varies a lot depending on the type of business you choose. It can be anywhere from a few thousand to a few million pesos. But whatever type of business you’re looking at, just remember that you’ll probably need enough cash to cover more than just the upfront cost. You’ll need to have enough money to cover costs for the first few months when your business may not be earning money yet. Not to mention, you’ll also need to invest a ton of time and effort if you want to give your business the chance to succeed. Investment Period: It takes time for businesses to break even and earn a profit. While some only take a few months, others can take years. And either way, one thing’s for sure—there is no such thing as an overnight success. You’ll need to work hard and work consistently on building your business if you want any chance of seeing a return on your investment. Risk and Return: A business is one of the riskiest investments you can make. It takes more work than any other investment, and even then a lot of businesses will fail within the first year of operations. But if you’re willing to take the risk, put in the work, and keep going despite the challenges, then your business could become a cash cow and the best investment you’ve ever made. There are two popular types of real estate investments in the Philippines—condos and land. There are some differences depending on which one you choose, but both don’t require that much maintenance and the potential return is quite high. If you can afford the high price tag, real estate might just be the right investment for you. Minimum Investment: Depending on where the condo or piece of land is located, your cash out can be just a few hundred thousand pesos or a few million pesos. Compared to other options like stocks or mutual funds, you’ll definitely need to spend more money, but it could also pay off greatly. Investment Period: With real estate, you can make money two ways: by renting out your property or through price appreciation. In both cases, it will take time for you to earn a profit. If you’re renting out a condo, you’ll likely have to hold on to your investment for at least 10 years before you recover your cost and start seeing returns. You could see returns faster if you’ve invested in land, but even this will depend heavily on the location of the land you’ve bought. Risk and Return: Real estate is a high risk high reward type of investment. The initial cash out is very high compared to other investments, and it’s very difficult to sell if you suddenly need cash. Not to mention that even though the returns can be huge, they are not guaranteed. Investing in land is generally a bit safer than investing in a condo, but the demand for either can be unpredictable. Before investing in any property, make sure you do your research. If you’re the conservative type of investor and don’t mind a lower rate of return, you can look into buying some bonds. When you buy bonds, you’ll know exactly how long you need to wait and you’ll also be guaranteed a certain rate of return. Just make sure that you can leave the money invested for the entire maturity period, because pulling out the investments early will mean losing money. Minimum Investment: You can invest in retail treasury bonds (RTBs) for as low as P5,000, though many banks will require larger minimum investments. Because bonds have such low interest rates, then you may want to invest more if you can. That way, you’ll earn more actual pesos in profit. Investment Period: Bonds will usually have longer investment periods that are a few years long, sometimes more. But the good thing is that you can find out the exact investment period upfront, even before you put out any money. Make sure you ask about the bond’s maturity date and that you won’t need the money before then. Risk and Return: Both risk and return are very low for bonds, which is why they are recommended for conservative investors. Though your money won’t earn huge amounts of interest, at least you’re not likely to lose any money. At the very least, you’ll get an interest rate that’s higher than what you would get in a savings account. Time deposits are very similar to savings deposits, except that there is a specific date of maturity when you can take out your money. Because it’s such a low-risk investment, you can expect low returns as well. However, like bonds, this is another type of investment that will at least get you slightly more returns than a regular savings account. Minimum Investment: The minimum investment for a time deposit can be as low as P1,000. But keep in mind that banks will usually give you a higher interest rate if you put in a larger investment. Investment Period: The investment period for time deposits can also be very short—as short as 30 days. But again, keep in mind that banks will usually give you higher interest rates if you agree to a longer investment period. Risk and Return: Time deposits usually have extremely low risk and extremely low returns. Some of them will have an interest rate that’s only 0.25% before tax—that’s the same as a regular savings account. But if you agree to a longer investment period or invest larger amounts of money then you can get a better interest rate. We recommend looking at other low-risk investment options too so you can decide if this is really the best option for you. At the end of the day, anything that can make your money grow can be considered an investment. These definitely aren’t all the options, but we hope this helped you understand some of the most popular investments in the Philippines better. Only you can take this information and really look within yourself to find out what the best investment for you will be. What are some of the best investments you’ve ever made? Let us know in the comments below! Why Financial Education is Important to Filipinos?